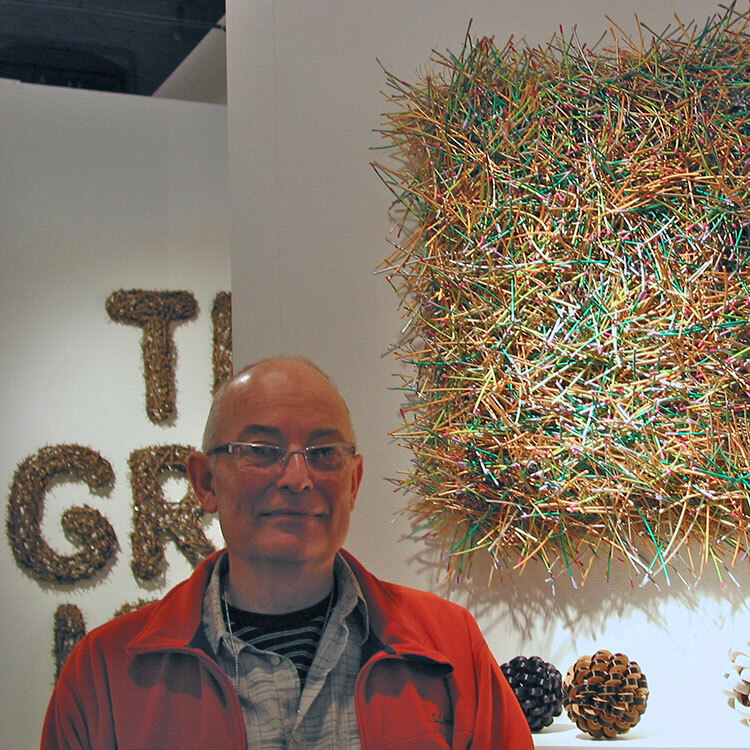 May was quite a busy and exciting month here at browngrotta arts. 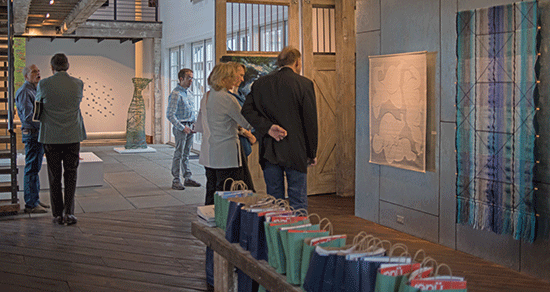 We ended April and kicked off May with our annual Art in the Barn Exhibition, Blue/Green: color/code/context. The exhibition attracted a record-breaking crowd that swarmed from all areas near and far. In addition to the opening itself, we hosted “Art-Ocean-Energy” a fundraiser for Ports of Cause as well as an IDCEC accredited presentation “Material Matters: Integrating Art Textiles and Fiber Sculpture in Architecture and Interior.” We also published our new catalog Blue/Green: color/code/context. The catalog–our 48th volume–features work by 57 artists from over 15 countries. Blue/Green: color/code/context is available for purchase on our online store and Amazon. To kick off May’s New This Week we shared Ulla-Maija Vikman’s Reflect. 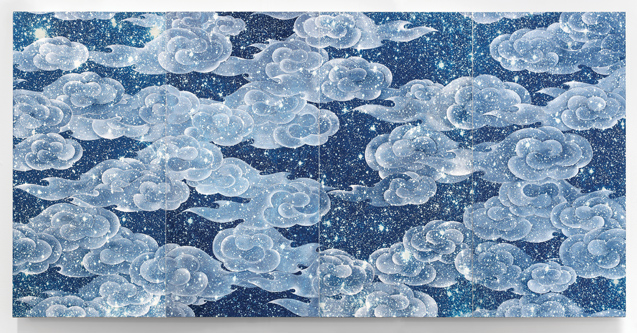 Made by hand-painting viscose yarn and linen, Vikman’s Reflect falls freely into space and forms varying color surfaces as air flow causing the uniquely painted fibers to move. 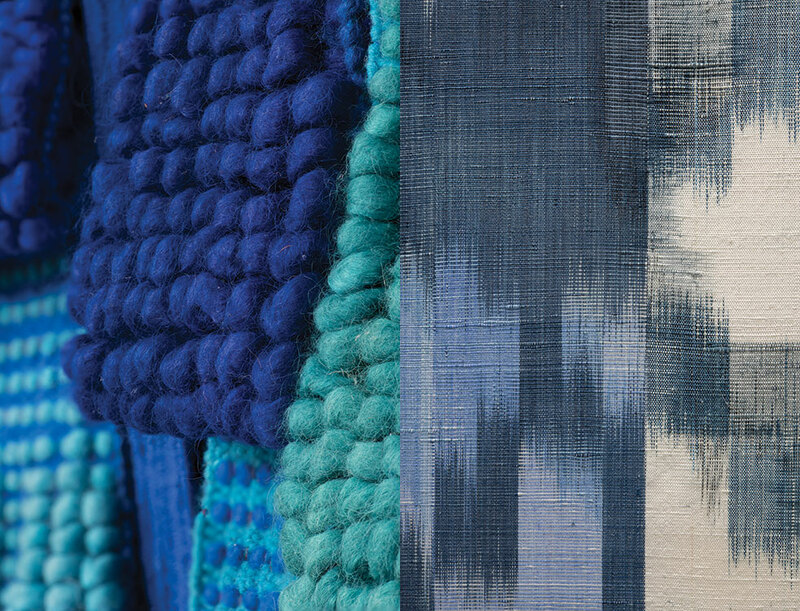 Vikman found combining the color blue with textiles very interesting because of the way in which they juxtapose each other. 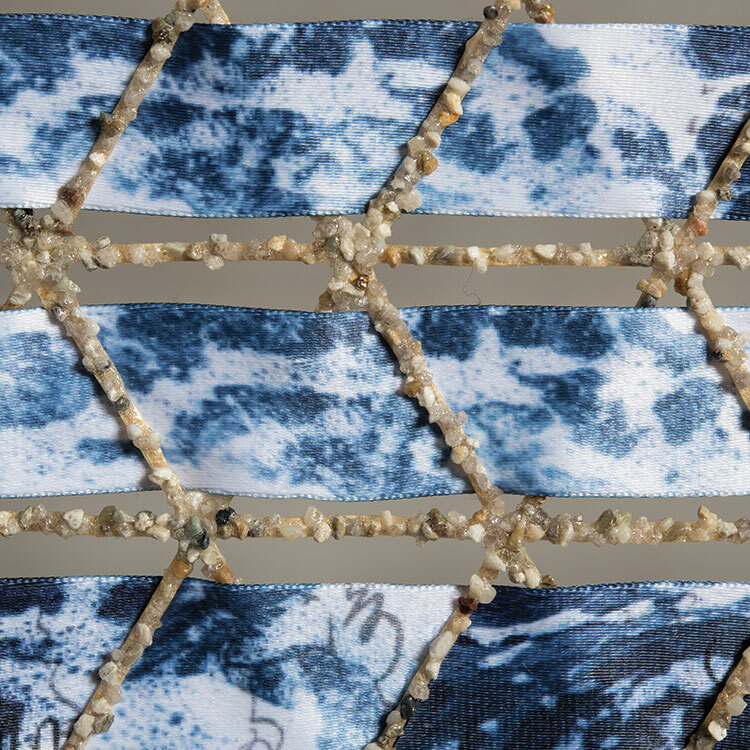 “Textile is material and tactile. Blue is immaterial, airy and spacious,” explains Vikman. Next up we had Changing Tides by Wendy Wahl. Made of 275 pages of 1988 Encyclopedia Britannica Annual of World Data, Changing Tides continues a series Wahl developed from her interest in expressing our station in time through the use of materials that have been a part of a particular collective consciousness. 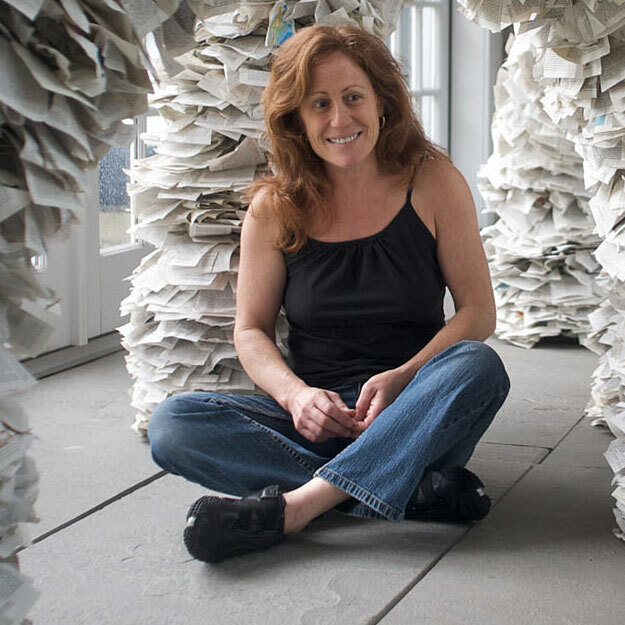 Wahl cut the encyclopedia pages into seven sections, for each of the continents, and thoughtfully scrolled and compressed into 1,925 whirls to symbolize the reality of rising water around the globe. Blue Wave, Ferne Jacobs, coiled and twined waxed linen thread, 19” x 17.5” x 6”, 1994. Photo by Tom Grotta. Lastly, Ferne Jacobs’ Blue Wave. 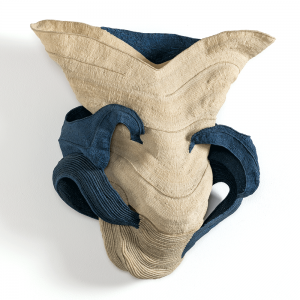 Jacobs, who began making sculptural baskets in 1970, uses waxed linen to create intricate, coiled designs that evoke organic forms. 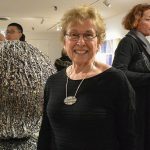 Jacobs’ commitment to fiber sculptures grows out of a fascination that thread can be made solid, that by using only her hands and thread, she can create a form that can physically stand on its own. The companion catalog for Blue/Green: color/code/context is now available for purchase in the browngrotta arts online store and on Amazon. The catalog— our 48th volume—contains 148 pages, 158 color photographs of work by 57 artists from over 15 countries. The pieces featured in the exhibition and catalog were made using traditional materials such as cotton, linen and wool as well as a wide array of untraditional materials. For example, Tamiko Kawata uses small black safety pins and cardboard in Green Blue Screen One. Gyöngy Laky’s Our Egg, which references our precious, life-giving and life-sustaining blue/green orb, is made of telephone wire, wine bottle wire, and a light green chicken egg. In making Real, John Mcqueen used cut up plastic bottles and sticks. The catalog’s essay, “Analogous Artistry: Blue/Blue Green/Green,” is written by Leatrice Eiseman, a color specialist whose expertise is recognized worldwide. In addition to heading the Pantone® Color Institute, Eiseman is the director of the Eiseman Center for Color Information and Training. 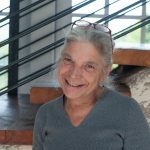 She is the author of 10 books on color, including Color: Messages and Meanings a Pantone® Color Resource and most recently, The Complete Color Harmony, Pantone® Edition. 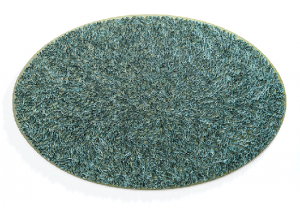 In her essay, Eiseman delves into the cultural, historical and emotional references to blue and green. The catalog features two-page spreads of each work in the exhibition. The essay and back pages are illustrated with more-than 20 photographs of additional works of blue and green. In summary, Blue/Green: color/code/context is a wide-ranging survey of ways that artists interpret these colors and the influence they exert. 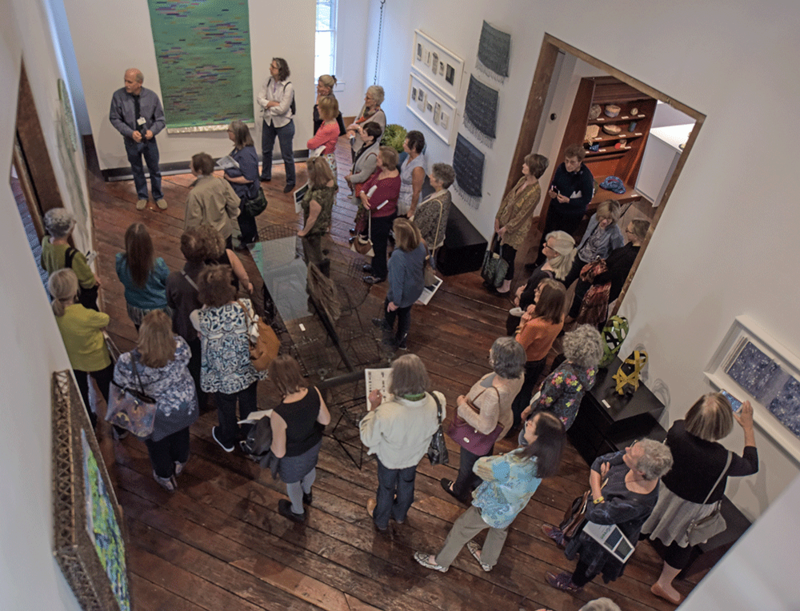 We had record crowds in attendance and a record number of sales at browngrotta arts in Wilton last week for Blue/Green: color/code/context. At our VIP preview event on Friday, we hosted our clients, collectors and art appreciators and our event sponsors from Litchfield Distillery, venü Magazine and Country Club Homes. Saturday we hosted 10 artists from the exhibition (Keiji Nio and family all the way from Japan, Kiyomi Iwata from Virginia, Pat Campbell from Maine, Lewis Knauss, Nancy Koenigsberg, Polly Barton and Tamiko Kawata from New York, Wendy Wahl from Rhode Island and Dawn MacNutt from Nova Scotia) and loads of visitors, too. Sunday and Monday we were busy all day. Tuesday we hosted a good crowd of appreciative and knowledgable members of the Surface Design Association. 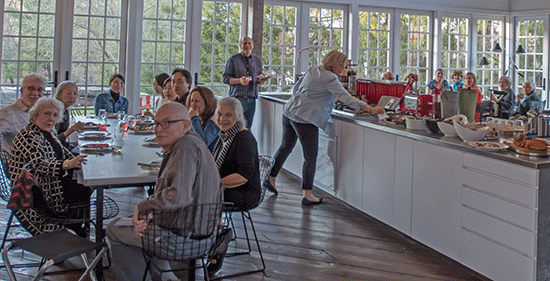 Wednesday was educational — we presented Material Matter: Integrating Art Textiles and Fiber Sculpture into Interiors and Architecture with the help of Mae Colburn from Helena Hernmarck’s studio and some interior shots from Walter Cromwell at Country Club Homes. Those in attendance were eligible to get Continuing Education Credit from the Interior Design Continuning Education Council. 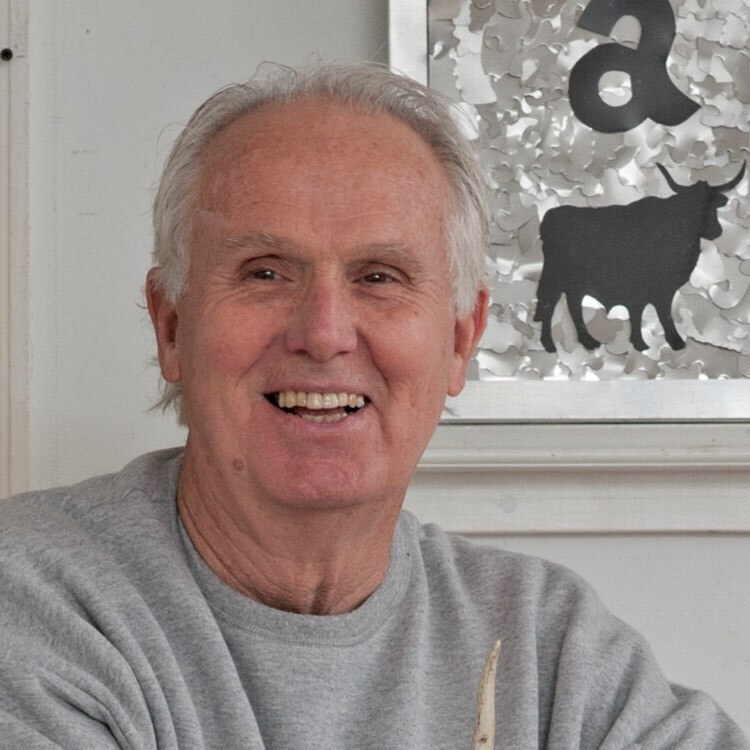 Thursday brought the Westport Arts Council Board and patrons another educated and interested audience. Arthur Bavelas, Founder of the Bavelas Group Family Office & Family Office Insights of New York City, speak about How sustainable innovation is driving the blue economy while benefiting our oceans and natural resources. A lively discussion followed. Saturday was a full day as was Sunday. Sunday evening we concluded our 10-day annual opening with a informed and engaged group from the Aldrich Museum in Ridgefield, Connecticut. Hope we’ll see you at browngrotta arts in 2019 at one or more of our annual events. In the meantime, you can find us online at browngrotta.com; talking about events and acquisitions and other art stuff at arttextstyle.com and on Facebook, posting items and images on Twitter and Instagram and videos on the browngrotta arts YouTube Channel. In planning your trip to browngrotta arts in Wilton, Connecticut for Blue/Green: color, code, context between April 28th and May 6th take some time out of your schedule to visit a few other exhibitions going on in the area. 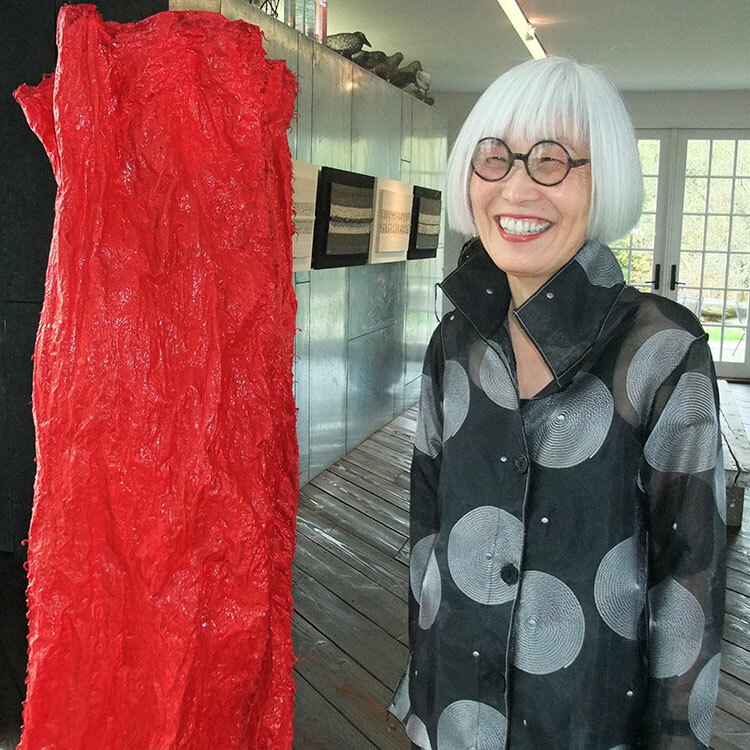 A short 15-minute drive from browngrotta arts, the Westport Arts Center’s current exhibition HandMade: Women Reshaping Contemporary Art features a diverse array of work from 15 leading female fiber and textile artists, including Ghada Amer, Anna Betbeze, Ligia Bouton, Orly Cogan, Lesley Dill, Terri Friedman, Sermin Kardestuncer, Sophia Narrett, Faith Ringgold, Miriam Schapiro, Judith Scott, Beverly Semmes, Rosemarie Trockel and Margo Wolowiec. The exhibition also features work by three browngrotta arts artists, Chiyoko Tanaka, Carolina Yrarrázaval and Norma Minkowitz. Curated by Elizabeth Gorayeb, the Executive Director of the Wildenstein Plattner Institute, Inc—a New York-based non-profit committed to art historical research—the exhibition examines the role of women in reshaping what has historically been considered “fine art.” Additionally, the exhibition demonstrates how fiber and textile materials allow artists such as Faith Ringgold and Sophia Narre to examine topics such as race, gender and sexuality. 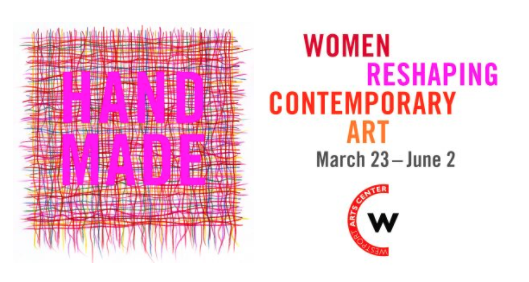 HandMade: Women Reshaping Contemporary Art will be on view at the Westport Arts Center through June 2nd. 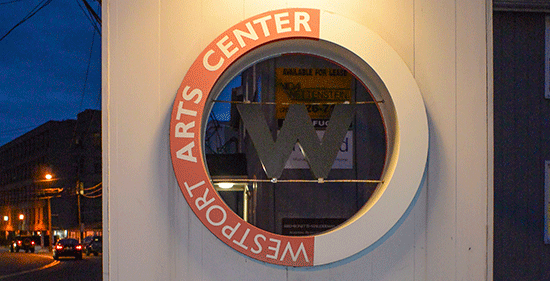 For more information visit the Westport Arts Center website HERE. Next stop, the Katonah Museum of Art’s exhibition Long, Winding Journeys: Contemporary Art and Islamic Tradition. The exhibition looks at a group of artists of Middle Eastern and South Asian descent whose work engages the diverse forms of Islamic visual tradition to explore religion, culture and socio-political issues today. The title of the exhibition “Long, Winding Journeys: Contemporary Art and the Islamic Tradition” was inspired by Pulitzer Prize-winning playwright Ayad Akhtar’s essay The Breath of Miraj. Akhtar’s The Breath of Miraj conveys the manner in which Islam and its history can inspire creative life to become a “long, winding journey.” While making the pieces included in the exhibition, artists utilized some of the century-old forms that define Islamic art, such as calligraphy, miniature painting, geometric patterning, textiles and architecture. Long, Winding Journeys: Contemporary Art and Islamic Tradition will be available for viewing until June 17th, for more information on the exhibition visit the Katonah Museum of Art’s website HERE. Hot Art in a Cold War: Intersections of Art and Science in the Soviet Era will be on view until May 20th at the Bruce Museum in Greenwich, Connecticut. The provocative exhibition probes into the consequences of innovation in science, technology, mathematics, communications and design during the Cold War. 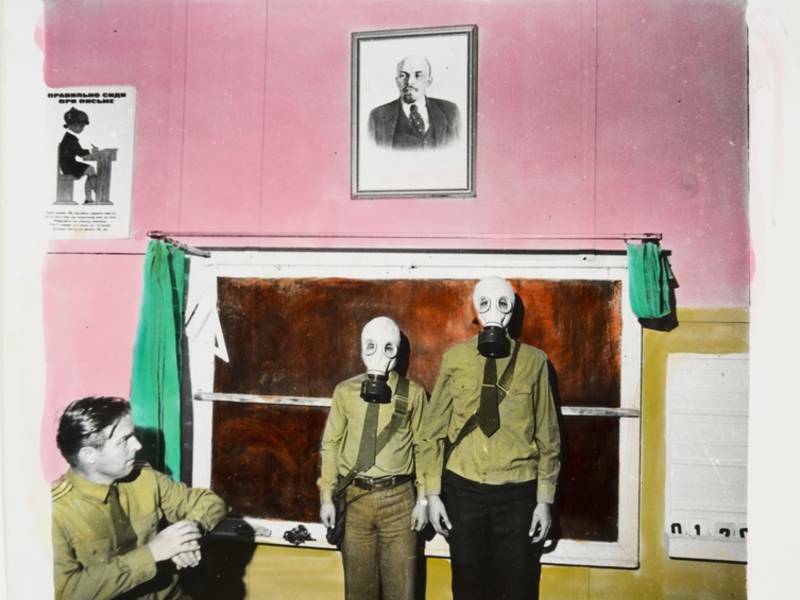 The exhibition juxtaposes the art made during the Cold War in opposition to state-sanctioned Socialist Realism with artifacts from the nuclear and space programs to explore the triumphs and tragedies unleashed by humankind as it gained the power to both leave the Earth and to destroy it. Produced from the 1960s to the 1980s, the items on view in Hot Art in a Cold War address themes of international supremacy and hegemonic power during a turbulent period marked by the ever-escalating competition for nuclear supremacy and the space race. “The Bruce Museum prides itself in being a museum of both art and science and in finding the interconnections between the two,” states Dr. Daniel Ksepka, Bruce Museum Curator of Science and co-curator of Hot Art in a Cold War. The exhibition allows visitors to “see how the triumphs of the space program and anxieties about nuclear arms were captured by period artists. Likewise, many of the scientific objects are works of art in their own right. The elegance of Sputnik, for example, is as striking and undeniable as its impact on the space race.” For more information on Hot Art in a Cold War: Intersections of Art and Science in the Soviet Era visit the Bruce Museums website HERE. 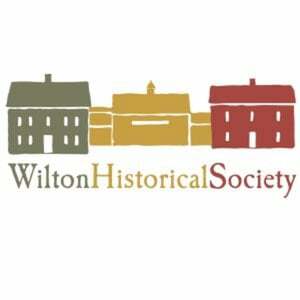 Last but not least, the Wilton Historical Society’s new permanent exhibition Connecticut History, Wilton’s Story is now available for viewing. Through artifacts and objects, the Wilton Historical Society aims to shine a light on Wilton’s roots and connections, as well as the evolution of the town since the colonial period. 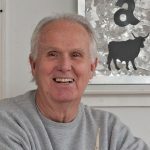 For more information on Connecticut History, Wilton’s Story visit their website HERE or call the Wilton Historical Society at 203-762-7257. Blue/Green: color/code/context opens at browngrotta arts, 276 Ridgefield Road, Wilton, Connecticut on April 28th (1 pm to 6 pm). Featured in the exhibition are more than 50 artists, including two new to browngrotta arts, Micheline Beauchemin of Canada and Polly Barton from the US. 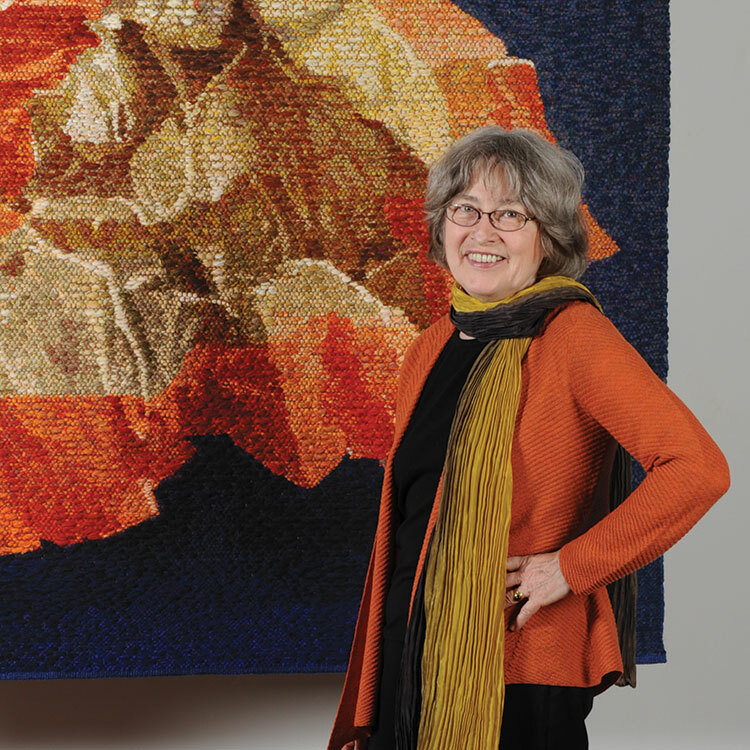 Polly Barton is a US artist known for adapting the ancient weaving technique of ikat into contemporary woven imagery. She has provided an ikat of silk, Pillar of Cloud, for Blue/Green: color/code/context. As a young artist, Barton worked as a personal assistant to Helen Frankenthaler. 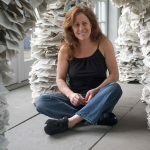 She cites that experience as a formative one, where she learned firsthand the inner drive, resilience, and intention necessary for an artist. The year also introduced her to the challenges and rewards of the New York art world. In 1981, she moved to Kameoka, Japan and lived in the religious heart of the Oomoto Foundation to study with master weaver, Tomohiko Inoue. In Kameoka, she practiced tea ceremony, calligraphy and Noh Drama with Oomoto’s master teachers. 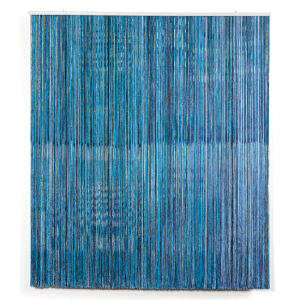 Barton has shown her woven ikats on both coasts. 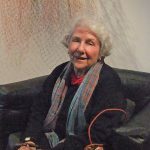 Her works are in the permanent collections of the Art Institute of Chicago, the Boston Museum of Fine Arts, and the Mint Museum among others. 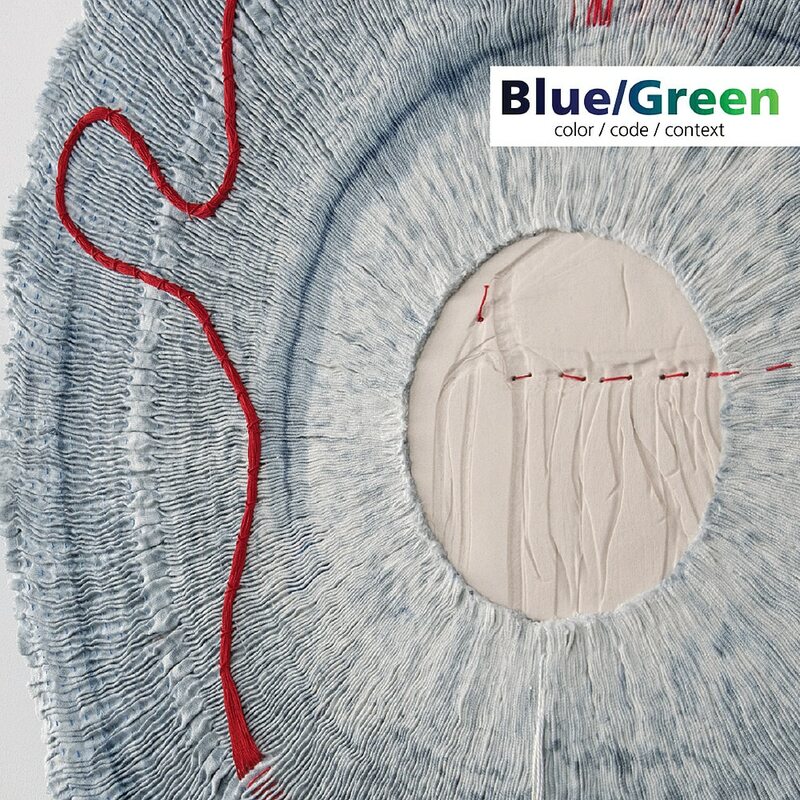 Blue/Green: color/code/context opens on April 28th for just 10 days. The 140-page color catalog will be available on the 28th at browngrotta.com. Details: Opening and Artists Reception, Saturday, April 28th, 1-6 pm; Sunday April 29th – Sunday May 6th, Hours: 10-5 pm. For more info: http://www.browngrotta.com/Pages/calendar.php; 203-834-0623.